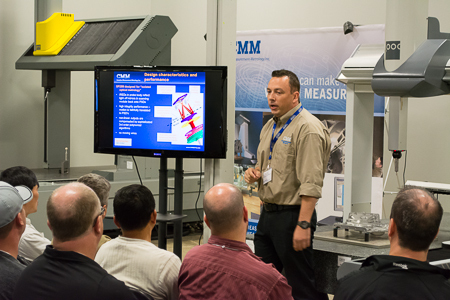 CMM Knowledge Tour 2013 Highlights - CMM Inc.
Our much anticipated Knowledge Tour 2013 has come and gone and we're happy to report that it was a great success! We had close to 80 industry professionals attend representing approximately 60 companies from all across Ontario. 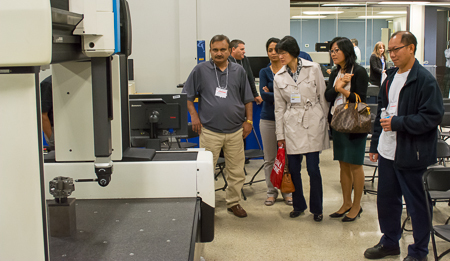 The showroom and equipment looked great with numerous machines running live demo programs continuously throughout the day. This was the opening event of the day which featured our Senior Applications Engineer, Grant Sewell, presenting a seminar on the new and innovative features of PC-DMIS 2013. Topics included Inspection Planner, Embedded GD&T and Creating Custom Reports. One popular element of this seminar was a preview of our new e-learning curriculum. Attendees were treated to an actual lesson presented exactly as it would appear in our e-learning package. Grant concluded by answering some of the questions we received in response to our customer survey. Following the presentation, our in-house PC-DMIS support staff were available for technical questions and one-on-one discussions. 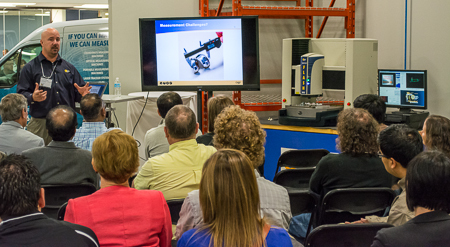 One of the more lighthearted presentations featured a friendly competition between 2 different 3D Scanners: the Leica Tracker and the Romer Portable Arm. 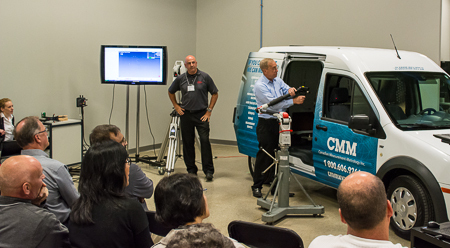 To set the stage, we rolled in one of our new CMM service vans and asked Scott Latham from Leica Tracer Systems and Burt Mason from Romer to impress us! While there was no clear winner, It was conceded that the Leica Tracker excels in scanning extremely large parts (up to 1050 ft), whereas the Romer Portable Arm has the edge when it comes to ease-of-use and versatility. It was all in good fun and the audience were very appreciative. Tom Groff from Optical Gauging Products joined us to present a very informative overview of the highly accurate vision system: OGP Smartscope, complete with a Laser camera and a video probing system. Using Measure-X software, Tom demonstrated such features as Edge Trace and Feature Finder in obtaining precision video measurements. In one corner, we had CMM's Rommel Nicasio armed with a Steinbichler White Light System; in the other, CMM Sales Associate Dragos Leu handled the Romer Laser Scanner. Both were given a hockey mask to reverse engineer and the results displayed and compared. When the dust settled, it was agreed that what the Romer lacked in accuracy, it made up for in versatility. CMM Applications Engineer, Allan McNeill, provided a comprehensive overview of the SP25M Analogue Scanning System to an enthusiastic audience. Analogue scanning, as opposed to touch trigger scanning, maintains constant contact with your part as it's measuring. The resultant scan data will contain a thousand times more information than a touch trigger scan. Featured on the sidelines, was the remarkable PH20 5-axis Probe Head. 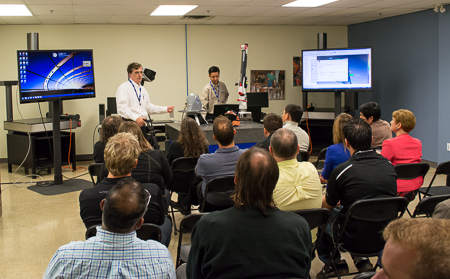 With its infinite probe angles and smooth, synchronized rotations during movement, it drew quite a crowd. On behalf of our staff here at Canadian Measurement-Metrology, we'd like to thank all who accepted our invitation and joined us on this special day. Any feedback would be welcome and appreciated!